One of the world’s foremost experts on the classic horror anthology television series, Rod Serling’s Night Gallery, Jim Benson has been featured in print, television, and home video. 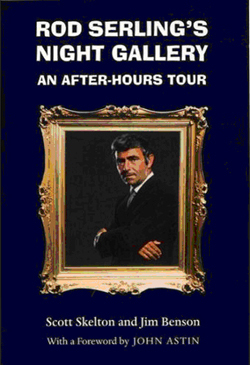 In the 1990s, Mr. Benson co-authored the definitive literary work on the history of the series Rod Serling’s Night Gallery: An After-Hours Tour with Scott Skelton, an ambitious project that spanned nearly four years. Jim subsequently co-produced the first VHS release of the series for Columbia House Video. This led to his being featured on screen and serving as Creative Consultant on the Mystery Channel’s documentary The Art of Darkness, which saw Jim interviewing nearly a dozen actors, writers, producers, and directors from Night Gallery. 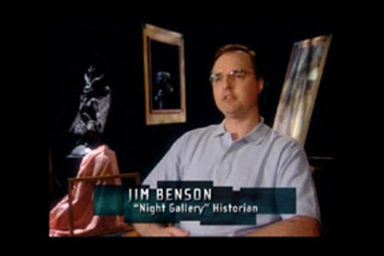 After years of effort on the part of the authors, in 2008, Jim was instrumental in bringing on board famed director Guillermo Del Toro (Hellboy, Pan’s Labyrinth) to Universal’s Night Gallery Season Two DVD release, on which Mr. Benson served as Historical Consultant with Scott Skelton (click on the video to hear Guillermo Del Toro discuss Jim’s efforts on behalf of the DVD project). Jim Benson has compiled a remarkable audio history of the series on his radio show TV Time Machine, interviewing Guillermo Del Toro on a special two-part program to discuss his passion for Night Gallery, director Jeannot Szwarc, who directed twenty-two episodes of the series, co-author Scott Skelton, Night Gallery artist Tom Wright, and Rod Serling’s widow, Carol Serling.